Treating a pool or spa has never been easier with chemicals packaged in water-soluble film. 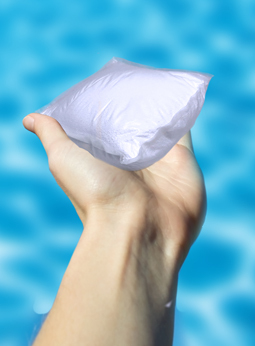 Each pouch made with MonoSol’s film safely and conveniently dissolves when dropped in the water. With water-soluble film technology, pre-measured pool and spa chemicals can be delivered in a single dose to protect users from harsh chemicals. Ensure consistent chemical application through MonoSol’s unit-dose delivery technology and avoid human exposure to harsh chemicals. Our pods safely and conveniently dissolve in water, delivering a consistent application without the hassle of measuring chemicals each time, in institutional and retail applications.